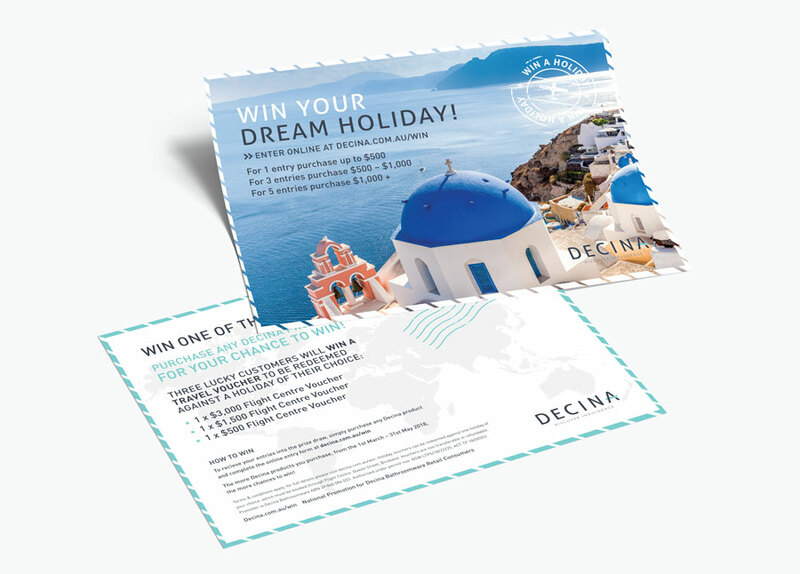 Decina are thrilled to announce the lucky winners of the 2018 ‘Win your Dream Holiday’ prize draw. To be eligible to enter, customers had to purchase any Decina, Aquatica or Heirloom product, between 1st March until 31st May 2018. Entries were calculated based on the value of the purchase. We would like to thank all those who purchased Decina and entered into the prize draw, however there could only be three lucky winners. The lucky winners have been contacted and provided details on how to redeem their prize, which must be booked through a specified Flight Centre Agent in Brisbane. From all of us at Decina, we hope our prize winners enjoy a relaxing break away from housing renovations! Please send us a Post Card! For all your darkest bath time desires, Decina presents its Kolora and Piccolo freestanding baths. Made from moulded sanitary-grade acrylic and meticulously designed for a seamless finish, each unit features a high-gloss black exterior and white interior, perfect to coordinate with more traditional white bathroom ware. Or make your spa a black spot for deep relaxation with Decina’s unique black spa jets. Made in Australia, they will add the perfect touch of black, instantly creating an ultra-modern look that’s just as comfortable as it is classy. To keep the magic coming, Decina has introduced black into its popular M-Series wall-mounted and freestanding shower panels, featuring chic charcoal tinted glass supported by black powder-coated braces. Also, the company’s black Heirloom accessories and towel warmers, designed in New Zealand, are versatile enough to complete the look or magically add that trendy touch to pre-existing white bathroom ware. As always, Decina’s products are made with the highest-quality materials, with a long warranty to ensure your beautiful bathroom lasts to heaven and black. Decina are thrilled to be nominated as one of the best bath tub brands by Australian Bathware Retailers, in the 2018 House of Home Bathware Excellence Awards. Voting is open to the public so home enthusiasts around Australia, will be able to vote for their favourite bathware brands from 31st May until 21st June. Awards are given to the brand with the most votes. 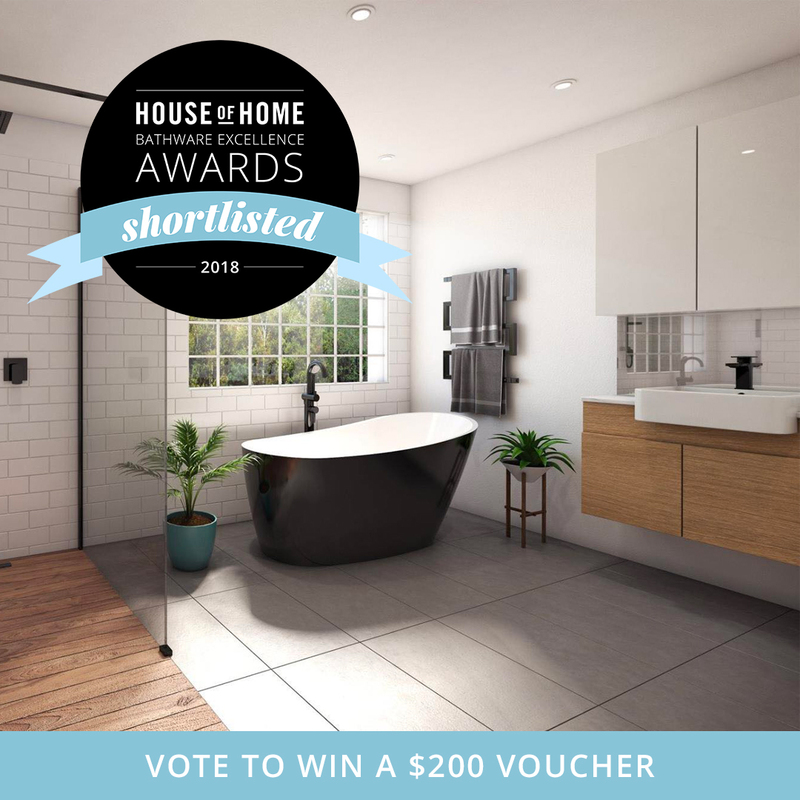 Please vote for Decina as one of Australia’s largest bath tub manufacturer and supplier in Australia – we would love to win this industry-wide accolade. An Australian-owned company with more than 27 years of manufacturing expertise, Decina has a large range of beautifully designed freestanding baths to suit any size bathroom and design. Made to Australian standards and rigorously tested, Decina’s range is of the highest quality and comes with a 10-year warranty. Freestanding baths provide a focal point in any size bathroom, with no limitations on where they are placed. They are easy to install as they do not require a hob, frame or any additional tiling. Decina’s range has various sizes and beautiful design options available. 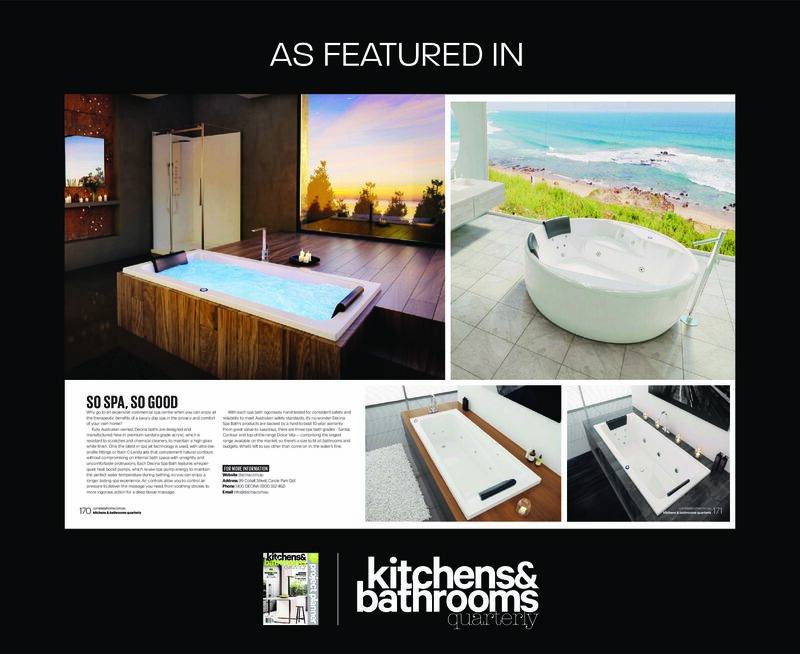 Decina manufactures some of the few freestanding baths available in the market in Australia that can be converted into spa baths. The Mintori and Orion freestanding spa baths are large enough for dual bathing and offer a luxurious day spa experience in your own home. The top-of-the-range Dolce Vita freestanding spa bath includes a remote spa key and chromotherapy lighting which uses seven colours to create a unique bathing ambience, healing the body through electromagnetic radiation. Decina ensures it keeps up with the latest bathroom trends. 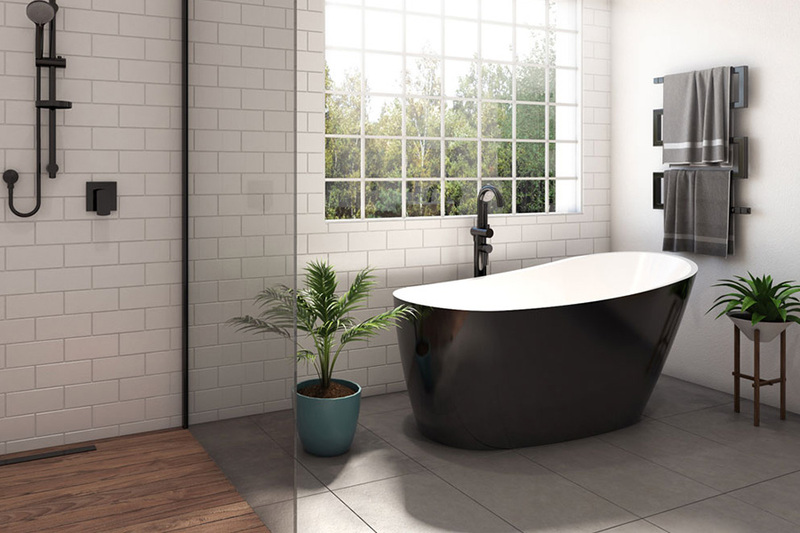 The Kolora, a black-and-white freestanding bath, fits perfectly with the modern, monochrome bathroom style, perfectly matching with the latest on-trend black tapware. The latest back-to-wall freestanding baths, the Aria and Alegra, feature a tile bead so they can be placed directly up against or away from a tiled wall depending on bathroom space. Decina’s products are Australia’s first choice for quality and value, specified by leading builders, architects and designers. An Australian-owned company with more than 27 years of manufacturing experience, Decina has an extensive range of beautifully designed, high-quality baths to suit bathrooms of any size and design. Made to Australian standards from premium sanitary-grade acrylic to provide a high-gloss white finish that is resistant to scratches and harsh chemical cleaners, Decina baths come with a long warranty of up to 15 years. 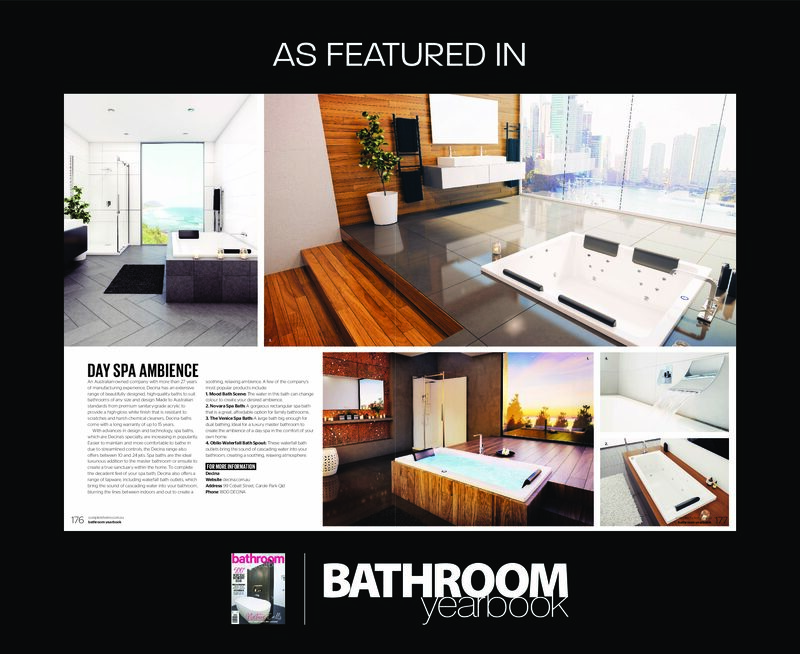 With advances in design and technology, spa baths, which are Decina’s specialty, are increasing in popularity. Easier to maintain and more comfortable to bath in due to streamlined controls, the Decina range also offers between 10 and 24 jets. Spa baths are the ideal luxurious addition to the master bathroom or en-suite to create a true sanctuary within the home. To complete the decadent feel of your spa bath, Decina also offers a range of tapware, including waterfall bath outlets, which bring the sound of cascading water into your bathroom, blurring the lines between indoors and out to create a soothing, relaxing ambience. 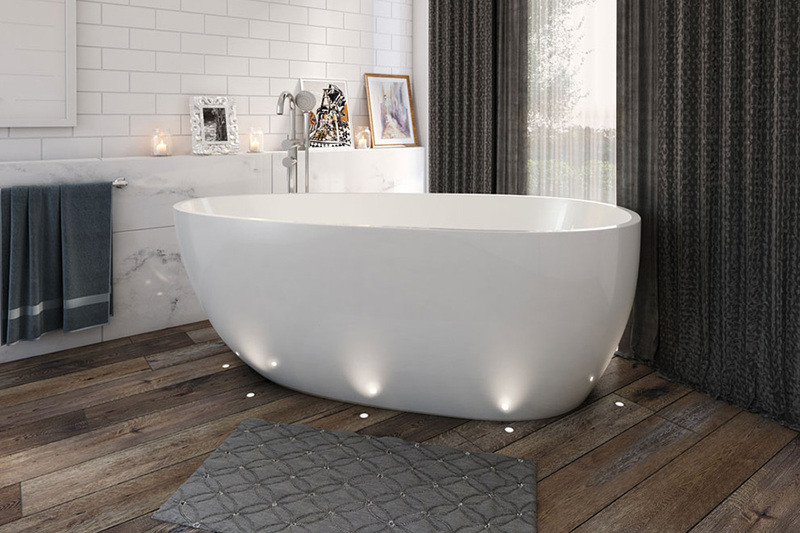 Mood Bath Scene: The water in this bath can change colour to create your desired ambience. Novara Spa Bath: A gorgeous rectangular spa bath that is a great, affordable option for family bathrooms. The Venice Spa Bath: A large bath big enough for dual bathing. Ideal for a luxury master bathroom to create the ambience of a day spa in the comfort of your own home. Oblio Waterfall Bath Spout: These waterfall bath outlets bring the sound of cascading water into your bathroom, creating a soothing, relaxing atmosphere. Why go to an expensive commercial spa centre when you can enjoy all the therapeutic benefits of a luxury day spa in the privacy and comfort of your own home? Fully Australian owned, Decina baths are designed and manufactured here in premium sanitary-grade acrylic, which is resistant to scratches and chemical cleaners, to maintain a high gloss white finish. Only the latest in spa jet technology is used, with ultra-low-profile fittings or flush C-LendaTM jets that complement natural contours without compromising on internal bath space with unsightly and uncomfortable protrusions. Each Decina Spa Bath features whisper-quiet heat boost pumps, which re-use spa pump energy to maintain the perfect water temperature during bathing, so you can enjoy a longer lasting spa experience. Air controls allow you to control air pressure to deliver the massage you need, from soothing strokes to more vigorous action for a deep tissue massage. With each spa bath rigorously hand tested for consistent safety and reliability to meet Australian safety standards, it’s no wonder Decina Spa Bath’s products are backed by a hard-to-beat 10-year warranty. From great value to luxurious, there are three spa bath grades – Santai, Contour and top-of-the-range Dolce Vita — comprising the largest range available on the market, so there’s a size to fit all bathrooms and budgets. What’s left to say other than come on in, the water’s fine. With its high reclining back rest and ultra-thin edges, the Piccolo is a striking addition to any bathroom. Due to high demand the Piccolo is now suitable for any size bathroom, with the addition of two new sizes. a 1400m and 1700mm. Deceptively spacious the Piccolo will provide a long lasting and comfortable, luxury bathing experience. 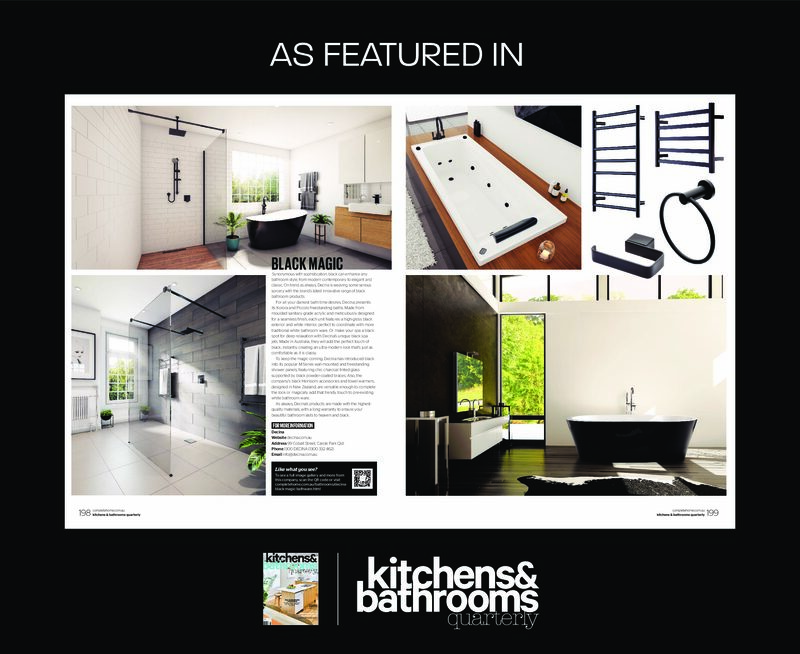 The Piccolo Black edition is finished in high gloss black with a white high gloss interior, combine it with modern black tapware and accessories for a sophisticated, seamless on-trend bathroom style. Decina leads the way in quality, innovation and design with its latest range of Freestanding Baths. Created from a two piece moulded sanitary grade acrylic sheet, where meticulous manufacturing techniques and the latest technologies create a seamless appearance. Our stunning, designs unique to Decina, will provide a real focal point and enhance your bathroom. Easy to install with no limitations on where they are placed, combine with a freestanding bath filler or mixer for a modern, seamless bathroom design. The Rosa has been designed for lovers of oval baths. The Rosa is a beautiful, delicate oval shape with a centre waste. 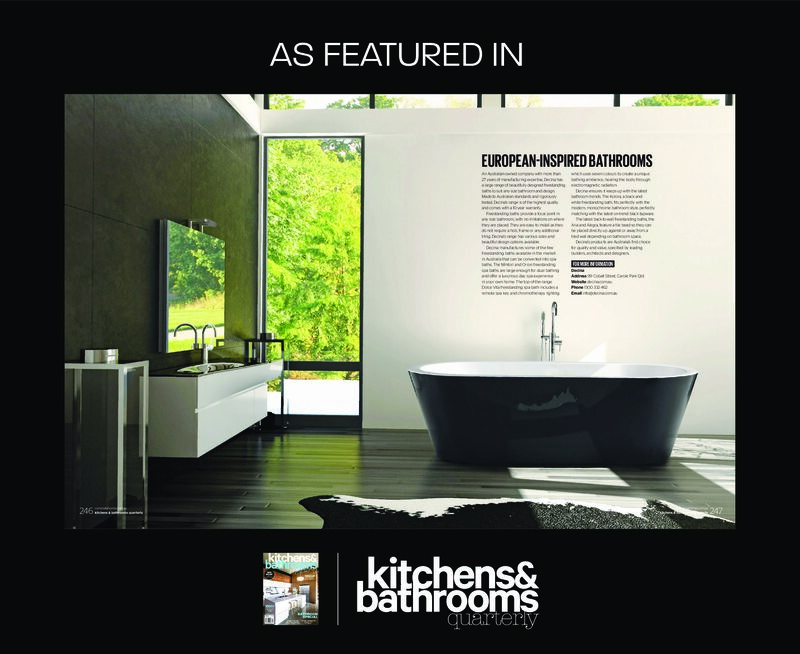 Its elegant curves will enhance and create a luxury style in any bathroom. It has a centre waste and finished in high gloss white. The Sofia has been designed for lovers of modern, organic shape baths. The Sofia is a beautiful, delicate oval shape with a large bathing area which will enhance any bathroom and provide a beautiful feminine, designer look.